The rich flavor of oven roasted vegetables, combined with my garlic herb tofu ricotta and some tangy sweet marinara. This gluten-free, vegan lasagna recipe is elegant, delicious, and perfect for the entire family! Pre-heat the oven 450 degrees. Line a baking tray with parchment paper. Combine all the sliced veggies (mushrooms, bell peppers, onions) in a mixing bowl. Toss with 2-3 teasp olive oil and season with salt. Add the veggies onto the lined baking tray and spread out evenly. Bake in the oven for 15-25 minutes until the veggies are roasted and just slightly charred (be careful not to burn them). You may need to toss the veggies once in between to keep from burning. Once they are done, remove and set aside. While the veggies are roasting, heat a large pot of water to boiling. Add a little salt and olive oil to the water. Once boiling, reduce heat to maintain a gentle boil and add the lasagna sheets. Depending on the type of pasta you are using, follow the directions on the box and cook the sheets till very al dente (be sure not to over cook since you will continue to cook the pasta later when it's baking in the oven). Stir often to prevent from sticking. Use a 9x13" glass baking dish. Spread a layer of marinara sauce at the bottom of the dish. Arrange one layer of lasagna noodles lengthwise (about 3 long noodles, edge may overlap, depending on your pan) over the sauce. Spread a layer of the Garlic Basil Vegan Ricotta over the lasagna noodles. Top with a generous layer of marinara sauce. followed by a layer of roasted veggies. 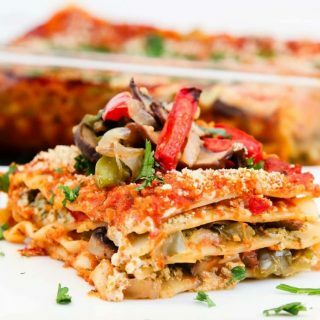 Repeat the above step TWICE for two more layers of lasagna noodles lengthwise, followed by the vegan ricotta, a generous layer of marinara sauce, and some roasted veggies. Finish with another layer of noodles (using about 12 sheets total). Spread the remaining sauce over the top layer of noodles. Seal the baking dish with foil and bake in the oven at 375 degrees for about 15-20 minutes until heated through. While the lasagna is baking, prepare the breadcrumbs by combining all the ingredients for Italian Breadcrumbs above into a mixing bowl. Add a tiny amount of olive oil and mix once more. Set aside. Remove the foil, top the lasagna with a generous layer of the prepared Italian seasoned breadcrumbs (note that you do not need to use all of the amount prepared). Bake once again, UN-COVERED, for another 15 minutes or until the breadcrumbs are golden brown in color. Remove the lasagna from the oven, top with finely chopped fresh basil and a drizzle of balsamic vinegar (use a spoon for this to avoid large amounts). (optional) Top with freshly ground black pepper and red crushed pepper for some added spice. Serve the lasagna with a side salad or some home-made garlic bread! Store any extra covered in the fridge and simply reheat in the microwave when needed. Instead of the breadcrumbs, you can top with your favorite vegan mozzarella cheese (daiya, or I prefer Miyokos fresh mozzarella ). Lasagna Sheets: I prefer using the gluten-free Tinkyada Brown Rice Lasagna Sheets since they taste exactly like the ones made out of wheat, but feel free to use any type. Prep-Ahead Tips: You can easily prepare the entire lasagna tray ahead of time and simply bake in the oven when ready. If you do this, be sure to remove the lasagna tray from the fridge ahead of time to allow it to get to room temperature prior to baking. The other option is to bake it for longer until heated through. The Garlic Herb Vegan Ricotta and Roasted Veggies can be made the day before and stored in the fridge. If you choose to cook the lasagna sheets ahead of time, be sure to drizzle a little oil onto the sheets to avoid having them stick or tear. For a low-carb option, use flat thin zucchini sheets in place of the lasagna sheets.